Bouchard shares his jazz side in this delightful duet arrangement for intermediate piano of his original piano solo, Cracked Soundboard Blues. This slow blues includes shared melodies, syncopated melodies, glissandi, and stride bass. 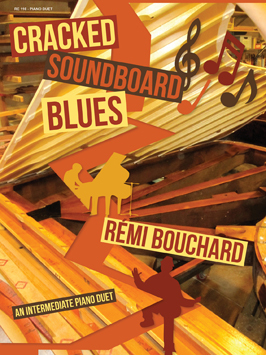 Cracked Soundboard Blues is ideal ensemble repertoire for study purposes, festivals and recitals – performers and audiences will be attracted to this appealing duet.